Built for speed as well as precision, the LTC6268 features 500MHz gain bandwidth product, sub-pF input capacitance and -100dB harmonic distortion at 1MHz. MILPITAS, CA – Linear Technology announces the LTC6268 and LTC6269, FET-input single and dual op amps, which deliver outstanding performance for high speed and high dynamic range transimpedance amplifier (TIA) and buffer applications. With just 3fA bias current at 25°C and 4pA max over the entire –40°C to 125°C temperature range, the LTC6268/LTC6269 can resolve input currents from several femtoamps to amps. Wideband voltage and current noise is 4.3nV/√Hz and 5.5fA/√Hz, respectively, enabling high dynamic range circuits. Built for speed as well as precision, the LTC6268 features 500MHz gain bandwidth product, sub-pF input capacitance and –100dB harmonic distortion at 1MHz. 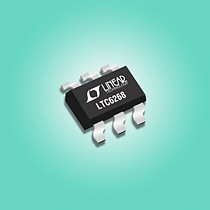 In addition to photodiode and photomultiplier (PMT) circuits, the LTC6268/9 are well suited for other high impedance sensor applications and for driving analog-to-digital converters (ADCs). The LTC6268 data sheet features circuit and layout techniques to maximize TIA performance, with example circuits ranging from 20kΩ transimpedance gain at 65MHz bandwidth, to 499kΩ transimpedance gain at 11.2MHz bandwidth. The LTC6268 is available in a 6-lead SOT-23 package, as well as an 8-lead SOIC with guard pins to protect against board leakage currents. The LTC6269 is available in MSOP-8 with exposed pad and 3mm x 3mm DFN-10 packages.